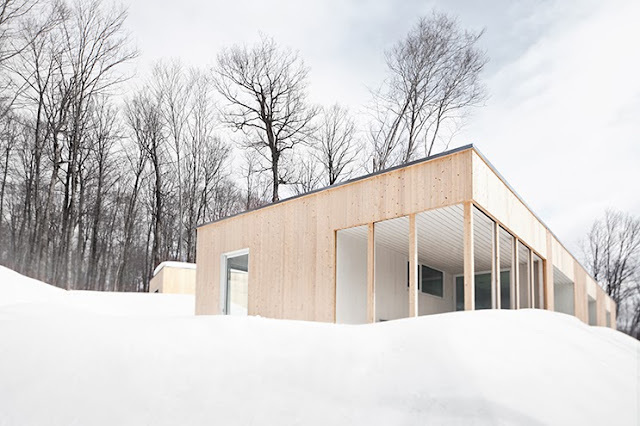 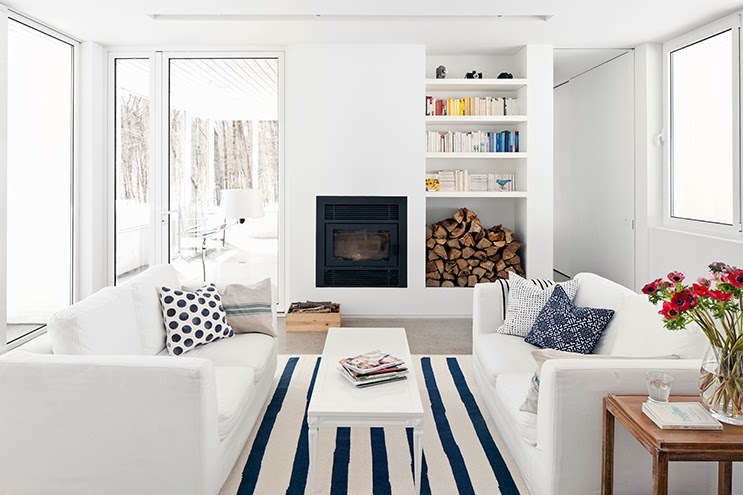 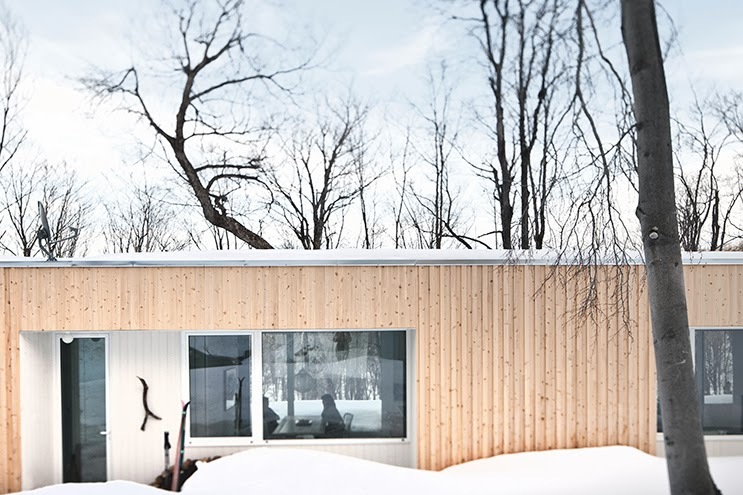 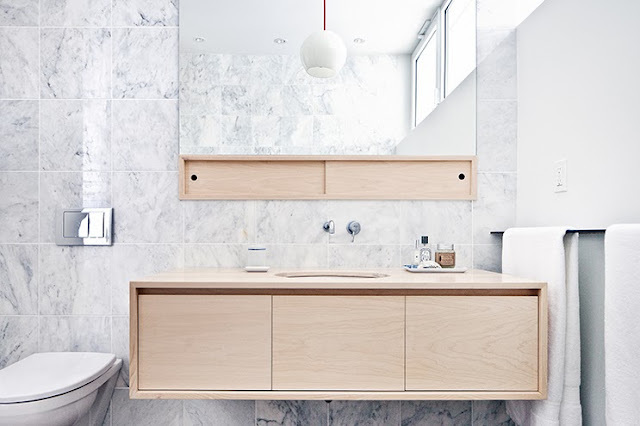 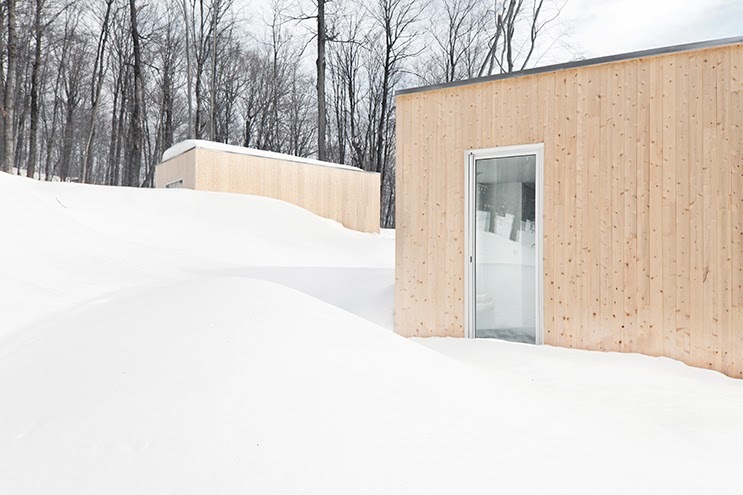 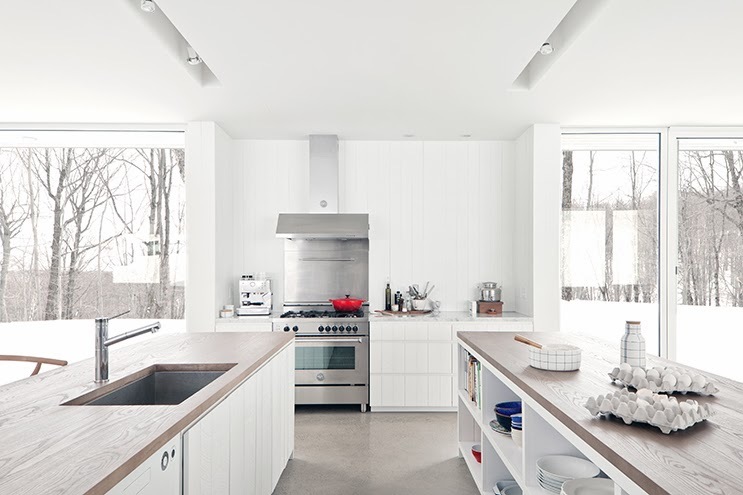 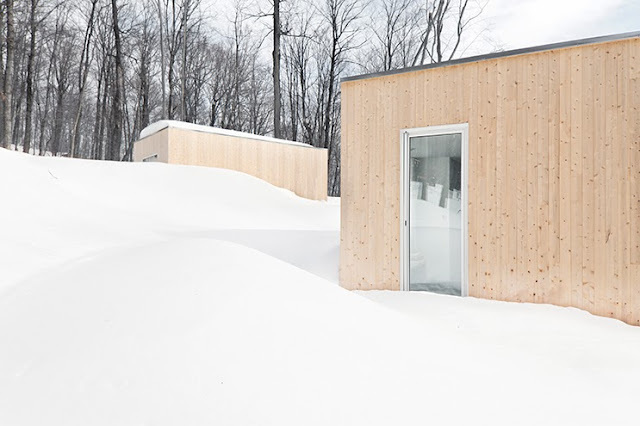 Blue Hills House, located in Morin-Heights, Canada, is a minimalist retreat designed by Montreal based la SHED architecture. 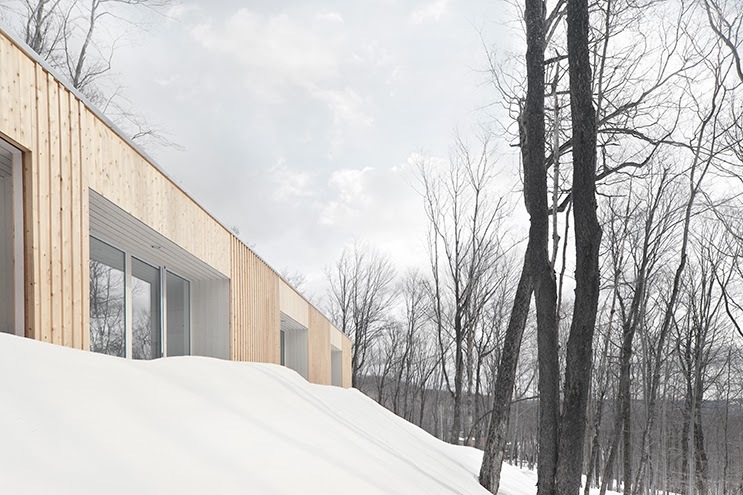 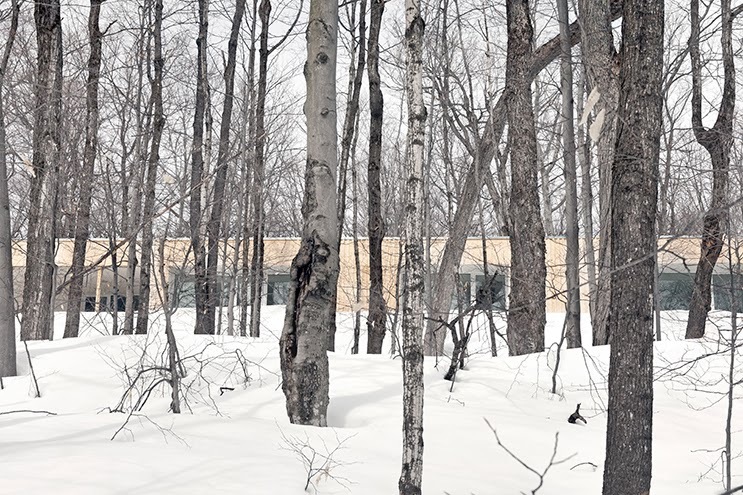 The house is intended to be inconspicuous into the forest and mountainous landscape, conceived as a single level volume, completely covered with natural white cedar siding that will become grey over time and blend with the barks of the surrounding trees. 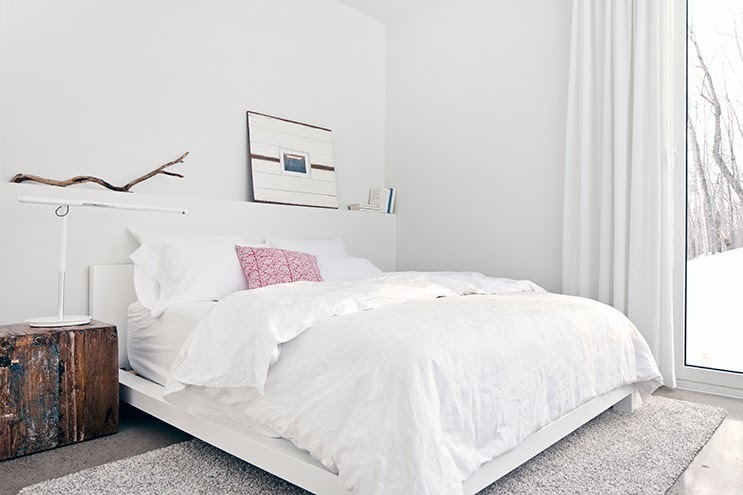 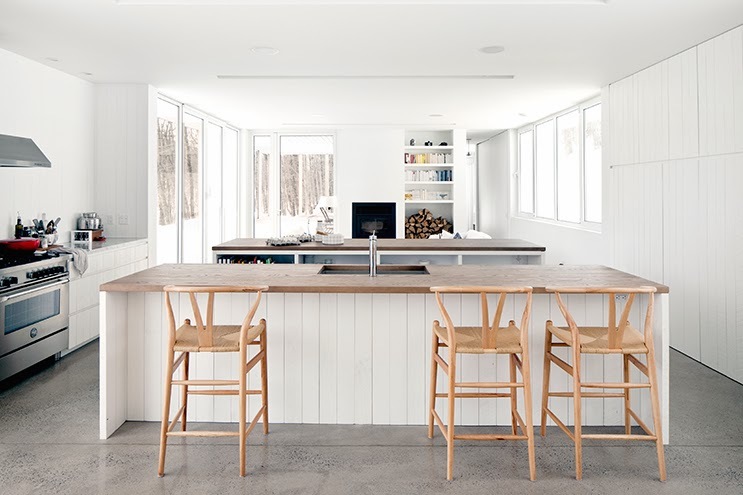 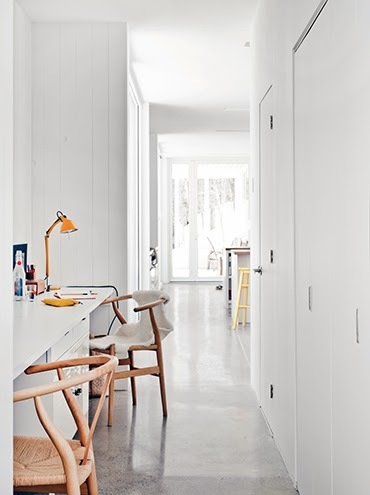 The simple, white interior is organised around the kitchen, the centre of the house. 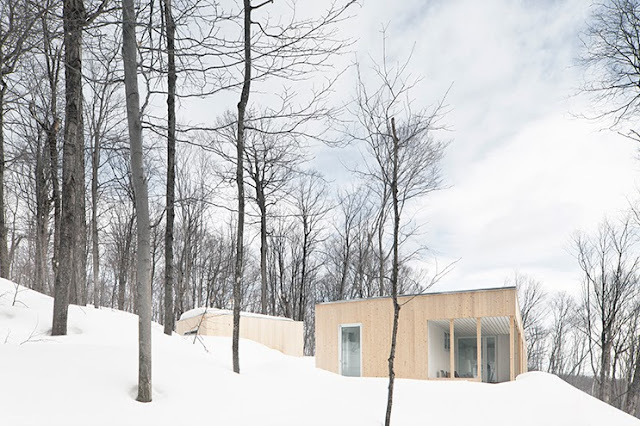 Located on a large property in the forest, this house is implanted on the edge of a slope on this mountainous site. In order to create an inconspicuous house in the landscape, the house was conceived all on the same level. The exterior is completely covered with natural white cedar siding which will become grey over time so that the residence will be even more unnoticeable behind the bark of the surrounding trees. 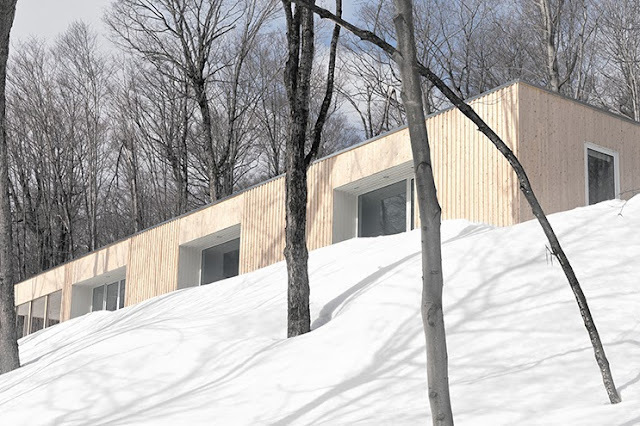 The simple and elongated volume of the house is punctuated with perforations forming white alcoves in which were installed the windows. 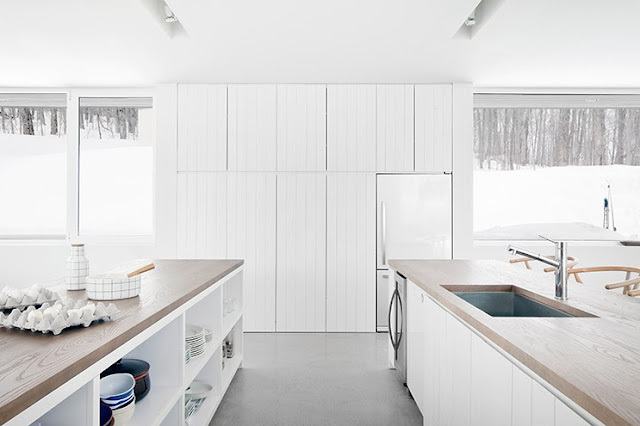 The interior is all organized around the kitchen, which is the center of the house. 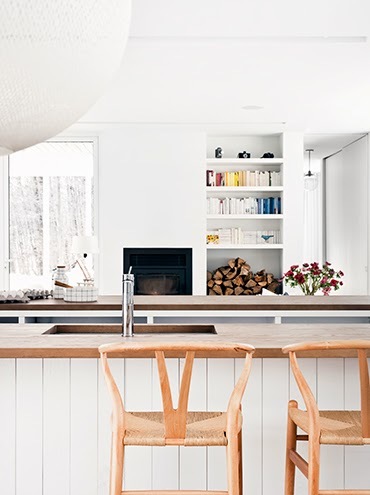 The kitchen is characterized by the presence of two large kitchen islands which are functional as well as creating a convivial ambiance. The living space (living room and dining room) are located on each side of the kitchen. 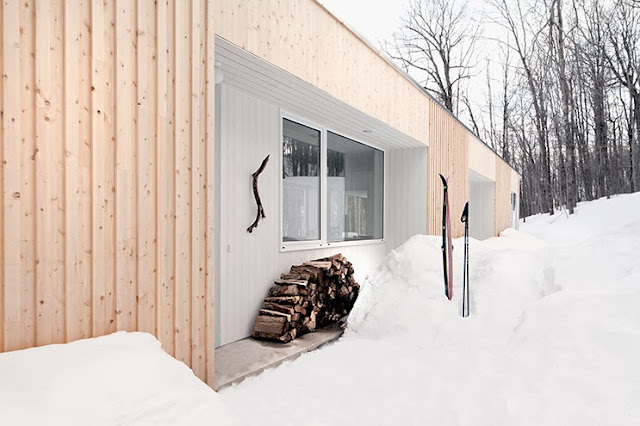 These spaces also extends to an outdoor veranda, integrated in the volume of the house. 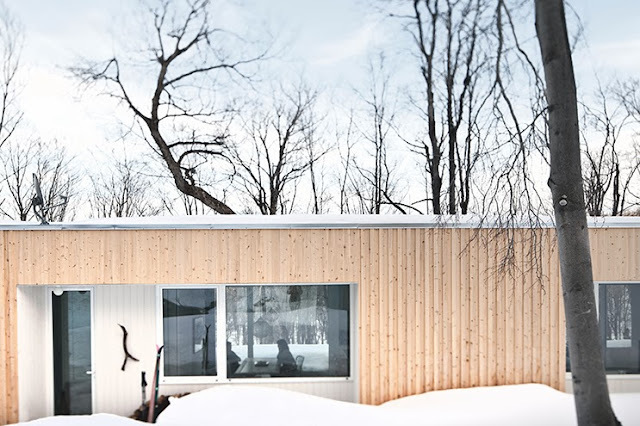 Large openings on both sides of the house helps giving a feeling of being outside while creating frames on the landscape. 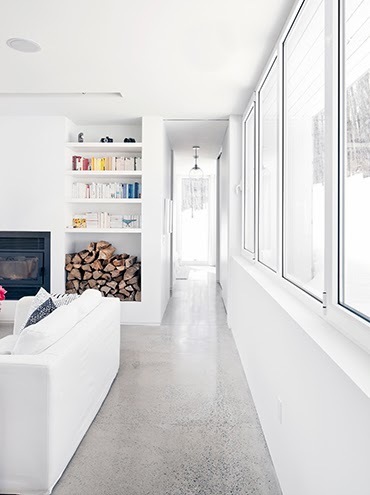 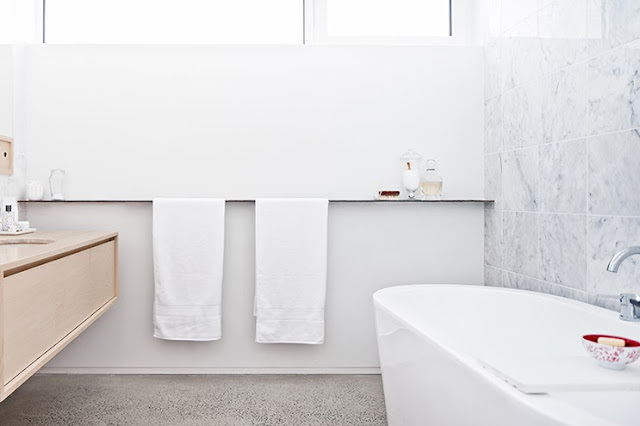 Inside, the polished concrete slab floor extends outside, both in the veranda and in the small alcoves.